In 2010, Asia Bibi, a Pakistani Christian woman, was sentenced to “death by hanging” for blasphemy against Islam. Her crime for the death penalty was allegedly making derogatory remarks about Islam to her neighbor. After this mother of four spent eight years on death row, Pakistan’s Supreme Court overturned her conviction on October 31, 2018. However, this decision was condemned by Pakistani Islamist parties — most prominently by the Tehreek-e-Labaik Pakistan (TLP) party which sparked mass protests in major cities and continued to call for her imprisonment and death. Succumbing to pressure, on November 2, the Pakistani government signed an agreement with TLP to bar Asia Bibi from leaving Pakistan while the Supreme Court ruling in her favor is under review for possible error. Asia Bibi’s life is in grave danger. Islamists are calling for her beheading. Two Pakistani politicians, Governor Salmaan Taseer and Minister Shahbaz Bhatti, were assassinated for supporting her release and opposing Pakistan’s blasphemy laws. Dozens more people in Pakistan have been killed as a result of blasphemy accusations. If any religious persecution case is critical and in need of quick attention, it is the case of Asia Bibi. This is a landmark verdict in Pakistan as two distinct groups — those promoting religious tolerance and the fundamental Islamists who oppose it — battle over the future of Asia Bibi. It is extremely rare that a blasphemy case is overturned in Pakistan, and we must act quickly. We thank you for your commitment to protect religious freedom and promote the importance of faith in the United States and around the world. Mr. President, in regard to this commitment, we call on your help now as a Pakistani Christian woman’s life is in imminent danger. As the leader of religious freedom around the world, the U.S. must remain committed to promoting the tolerance of religious minorities and respect for the fundamental human right of religious freedom. Therefore, we respectfully ask you to call for the full release of Pakistani Christian Asia Bibi to allow her to exit safely from Pakistan. 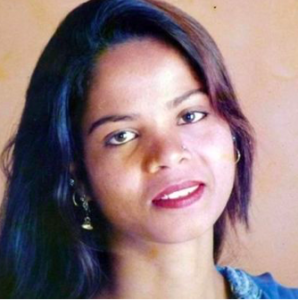 And as she is in dire fear for her life, we ask you to grant Asia Bibi religious asylum in the U.S. as soon as possible.